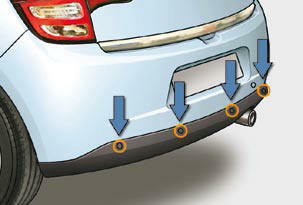 This system consists of four proximity sensors, located in the rear bumper. This detects any obstacle (person, vehicle, tree, gate, etc.) behind the vehicle, except obstacles located just below the bumper. An object, such as a stake, a roadworks cone or any other similar object may be detected at the beginning of the manoeuvre, but may no longer be detected when the vehicle comes close to it. The system is activated as soon as reverse gear is engaged, accompanied by an audible signal. 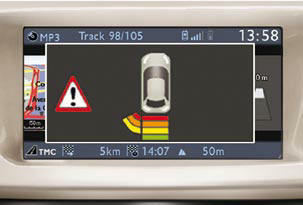 - a graphic on the multifunction screen, with blocks which become increasingly closer to the vehicle. 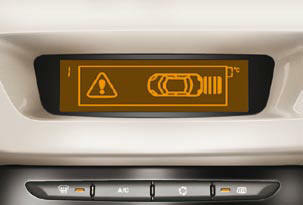 When the distance between the rear of the vehicle and the obstacle is less than thirty centimetres, the audible signal becomes continuous and the "Danger" symbol appears on the multifunction screen. On completion of the manoeuvre, when you exit reverse gear, the system becomes inactive. The rear parking assistance system cannot, in any circumstances, take the place of the vigilance and responsibility of the driver. You can activate or deactivate the system by means of the multifunction screen confi guration menu. The system state is memorised when switching off the ignition. The system will be deactivated automatically when towing a trailer or when a bicycle carrier is fi tted (vehicle fi tted with a towbar or bicycle carrier recommended by CITROËN). 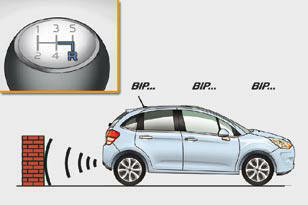 If there is an operating fault, when reverse gear is engaged the service warning lamp comes on, accompanied by an audible signal (short beep) and a message on the multifunction screen. In bad or wintry weather, ensure that the sensors are not covered with mud, frost or snow.